When you came into our lives, I was in a strange frame of mind. Translated from the Marathi by acclaimed novelist and critic Jerry Pinto, Sachin Kundalkar’s elegantly wrought and exquisitely spare novel explores the disruption of a traditional family by a free-spirited stranger in order to examine a generation in transition. 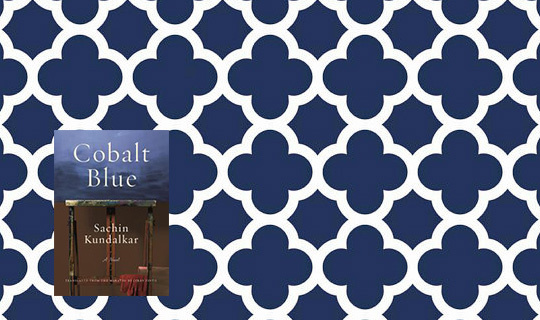 Intimate, moving, sensual, and wry in its portrait of young love, Cobalt Blue is a frank and lyrical exploration of gay life in India that recalls the work of Edmund White and Alan Hollinghurst—of people living in emotional isolation, attempting to find long-term intimacy in relationships that until recently were barely conceivable to them. Here, we present the opening pages of the novel. That you should not be here when something we’ve both wanted happens is no new thing for me. Today too, as always, you’re not here. The house is quiet. I’m alone at home. For a while, I basked in bed in the shifting arabesques of light diffusing through the leaves of the tagar. Then I got up slowly, and went down to the backyard, and sprawled on the low wall for a single moment. The silence made me feel like a stranger in my own home. I walked around the house quietly, as a stranger might. The chirping of sparrows filled the kitchen. The other rooms were quiet, empty, forsaken. In the front room, the newspaper lay like a tent in the middle of the floor, where it had been dropped. At the door, a packet of flowers to appease the gods and a bag of milk. Then I realized I was not alone. From their photograph, Aaji and Ajoba eyed me in utter grandparental disbelief. I took my coffee to the middle room window and sat down. That girl with the painful voice in the hostel next door—How come she’s not shrieking about something? To savour each bitter and steaming sip of coffee in such quiet?